I'd like to write a bit about the two motorcycles we used on our trans-North American ride in 2007. One of them was a Yamaha RZ350. In Japan the bike's called with an "R" at the end, RZ350R, probably because the name was domestically given to its predecessor, the model we call RD350LC in North America. 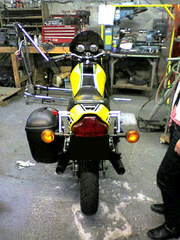 In the United States, the RZ was available new only for two years, 1984 and 1985. I bought mine on craigslist in spring 2004, about half a year after I moved to New York, and the bike had always accelerated me on my way to school through Central Park and on rides out into nearby regions. The other was a Kawasaki Ninja 250R. The specific model name for this one is EX250-F in North America, and people say it's what you use for a cheaper insurance premium, as it sounds a lot less sporty. The model was still available new in 2007 and I initially planned to get two of them. That way we would need less spare parts, tools, etc. The RZ was obviously unfit for a long trip, and until later I was almost determined to purchase two EX250s in different body colors. As I look back at my jottings now, I see myself some months before departure going quite into details about the model selection, how the first EX became mine, the notion of a handover from my RZ, and so on, not knowing (though somewhat hoping) that the RZ would eventually stay. A motorcycle ride across the United States: physically speaking, it's not that difficult (though I haven't done it before). Some guys did it on Z50 Monkeys, and many have done it on bikes without motors. If you want to make it tough, you can choose to go on foot or on electric mopeds like Kanichi Fujiwara did (their range is very limited and it takes long to charge their batteries). As far as you route your trip well, using 150ccs will be practical enough as they are freeway-legal in most states. For this transcontinental ride, I chose the Kawasaki Ninja 250R. It was called GPX250R in Japan and has been out in the United States for more than twenty years: a "well-seasoned" model. That means it's mechanically reliable. Plus it's currently available at dealers, and so will be its parts for us to purchase on our way. This is a big advantage. It won't go this way with my current bike, a Yamaha RZ350(R). The 250 Ninja is given a nickname of Ninjette in the United States, and loved by a wide range of riders. It's considered very suitable for novices, while being enjoyable for experienced folks as well. And above all, it's cheap. Its MSRP is $2,999. As two bikes are needed for this transcontinental ride, we can only afford to buy inexpensive ones. A brand new 2007 EX250 will perhaps cost about $3,500, all included. I wonder if I should look for a used one with a few years on it. In this price range there are some other models such as Honda's Rebel and Nighthawk 250, Suzuki GZ and Yamaha Virago. The Rebel, the GZ and the Virago belong to a category called cruiser types and appear to be good for long distance, but the fuel tanks are relatively small and you'll always have to care about the amount of gas left. I won't pick the Nighthawk as it's equipped with drum brakes and its air-cooled engine is said to be boring. The Ninjette has got disc brakes and a water-cooled engine on it, and its tank capacity × fuel efficiency is just excellent. I think I'll buy one by the end of the month. It's hard to part with my RZ though. It's been like summer in New York these days. We were using the heater several days ago, and now we're leaving the windows open even after dark to let the breeze in. I believe it was only about a week ago I saw some blossoms on a little cherry tree on my way from the train station back to this apartment, and they were already chased off by young leaves when I walked by yesterday. As it's bound to go sometime soon, I worked a little bit on RZ today, and later we went to Brooklyn. There we took a look at this used Kawasaki Ninja 250R, the model we've selected for our ride across the continent. Traffic was heavy perhaps because more people were outside under the summer sky. The bike was kept in a area a friend of mine used to live in, but it was the first time for me to go down there in the daytime and it took longer than I thought. The traffic was maddening on BQE (Brooklyn-Queens Expressway) and when we arrived we were fifteen minutes late. The bike was in very good condition, having been kept indoors on the second floor of a building during the winter. We took it outside, took some gas from my RZ for it, and woke up the engine from its hibernation. When it got warm enough, I test drove it in the parking lot. I made sure there seemed nothing wrong with the combustion and transmission, then tested if it could roll straight with both hand off the handlebars and tried some full brakes. The ground of the warehouse area was stone paved even inside the parking lot and didn't allow a perfect test ride, but I could tell that the bike was more reliable than my twenty-three-year-old RZ. If I can love it equally is another issue, though. The Expressway was still a bit crowded on our way back, and we got off to take the local streets. There's a small bridge at the end of McGuiness Boulevard that connects Brooklyn to Queens, and once on the other side our apartment is only a few minutes away. But when we got to the bridge there were long lines of cars again. And ahead of them was a vertical wall. I never knew it was a drawbridge. It started coming down for a moment but came back up again soon, cars barely advancing. Some drivers got off their cars and stared at the towering stretch of asphalt. As it seemed useless to stay there and wait, we went around the elevated lanes and stopped right below the bridge. A small tanker-like boat was just coming through. Beyond that I could see the Citi building standing with its LEGO-block top, one of the physical landmarks of Queens. Seeing the bridge coming down we drove back onto McGuiness, but the traffic there had become even worse. We didn't want to join the lines just to see the bridge come up again, so we gave up that route. In the afternoon sun, irritation was apparent on the drivers' faces. It felt slightly muggy in my leather pants. I thought I would probably have to punch little holes in them as we would be in places like Arizona. I remember a Mexican lady was selling water and oranges where we first got off the Expressway. Here're the newly purchased Ninjette and the RZ I'll have to let go soon. They're similar in color, and this way I would miss the old one a little less, I guess. I was lucky to find a yellow Ninjette at this very timing. The color of this RZ is called the "US Inter Color," used by Yamaha's factory racing team and also known as the symbol color of the GP racer "the King" Kenny Roberts. RZ350R was sold in Japan as well but the Kenny color was not available. If I were in Japan, I wouldn't have thought of riding such a beelike bike. It wouldn't match the surroundings, the color of the streetlights, and the damp climate of the country itself. But it feels just right in a dry and horizontal country like the United States. The RZ is equipped with an engine that works on a combustion mechanism called two-stroke, which burns specially designated motor oil together with gas, resulting in white smoke coming out of the mufflers' ends, plus the scent of the burnt oil. Wherever I went, this scent would always follow me there. The Ninjette on the other hand is a bike equipped with a four-stroke engine, free of the two-stroke fume, of the familiar scent of the roads. This change thus is a transfer from the rough, edgy yellow to another yellow whose corners are well rounded off. I need more time before I can feel that the Ninjette actually belongs to me, or even recognize it as "myself." When I no longer remember the sad-looking back of its former owner, young Arthur, then how would American roads appear to me? I've put about a 150 miles on the EX250 in this past week since registration, and found that it's a very well-balanced bike with no particular flaws. On a long trip that requires you to hold the throttle steady most of the time, it would be a lot easier to be riding a mild four-stroker like this than a two-stroker. I said mild but that doesn't mean slow. Assembled in 2002 on a sturdy frame with good suspensions and brakes, this petite tourer is more stable than the RZ when cruising at any given speed. It only feels relatively slower and that allows you to drive more relaxed in the flow of the traffic. I spent $1,900 for this used Ninjette with 7,500 miles (12,000 kilometers and some more) on it. Plus I paid about $250 to make it officially mine - tax and the fees for application and the plate. The proof of ownership will be sent to me within three months (a motor vehicle has to be bought and sold with one in order to be street legal). After this, one day in late May I went to pick up my RZ at the mechanic's shop where he had been gettin it ready for sale, and took a first ride in a while on it, just to realize I'd had to change my plans. It was obvious to me that, if I were to travel across the United States, there was no bike for me other than the one that I had always been with since I came to New York. Its low fuel efficiency and the low availability of two stroke oil could trouble me on the road, and in case of a mechanical problem I would probably have to wait weeks for repair parts, but all that would be nothing compared to leaving RZ behind and regretting it. Besides the sentimental issues like this, there of course were other reasons why I changed my mind about the bike I'd use. After I got the first EX, it took more than a month for the state DMV (Department) to send me the title, i.e. the proof of ownership mentioned above. You can't buy or sell a motor vehicle without it, meaning that, calculating backward from our intended departure in early August, we had to find and purchase the other used EX by mid June in order to sell it on the west coast. As we abandoned the plan of getting a second EX, my RZ was now back in position, waiting for some luggage-mounting modifications, and the yellow EX that I had bought for myself was taken over by my partner, who would be with me on this transcontinental ride. 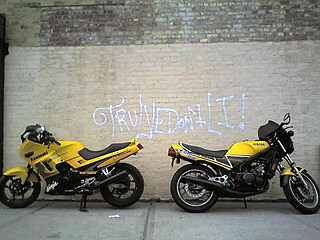 And thus in August 2007, there they were: two yellow bikes saddled up and ready for a little journey.